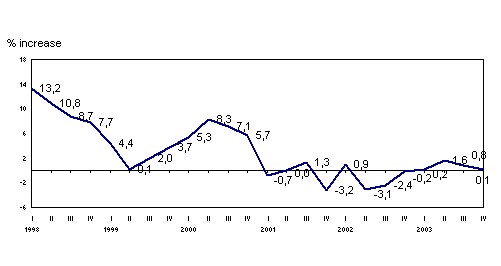 With this data, the General Production Index registered a 1.2% increase in 2003. Industrial production in the A.C. of the Basque Country for December grew by 3.9% in absolute terms in relation to the same month of 2002, according to EUSTAT data. Measured in homogenous terms of the working calendar, the inter-annual variation was 0.2%, since in 2003 December had one more working day than it did in 2002. The accumulated growth rate for 2003 as a whole, in comparison to the previous year came to 1.2% in absolute terms and 0.7% in homogenous terms of the working calendar. In December 2003, the most positive inter-annual variations, in absolute terms, were in the sectors "Rubber and plastic" (17.9%), “Transport material” (12.8%), "Chemical industry" (11.8%), "Electric material" (7.5%) and "Metallurgy and metal articles" (6.9%). Sectors experiencing the most negative inter-annual rates were "Textiles and clothing" (-49.1%), "Leather and footwear industry" (-11.7%), "Timber industry" (-8.0%), "Electric energy, gas and water" (-7.7%), "Machinery" (-5.8%) and " Other manufactured" (-4.2%). By economic destination of goods, inter-annual rates in December 2003 rose in the case of Intermediate Goods (7.5%) and Consumer Goods (2.6%), whereas the rate fell for Capital Goods (-3.1%). The balance for 2003 shows a 1.2% increase in the accumulated rate of the General Industrial Production Index in comparison to the previous year, which, once the effect of the working calendar is corrected to obtain a homogenous comparison of data, shows accumulated growth for 2003 of 0.7%. In 2003 as a whole, the highest accumulated growth, in absolute terms was in the following sectors: “Oil refining” (21.4%), "Rubber and plastic" (7.1%), "Electric material" (6.4%) and "Chemical industry" (2.9%). Conversely, the most negative accumulated rates were in "Leather and footwear industry" (-14.7%), "Other manufactured" (-4.7%), "Timber industry" (-3.7%) and "Machinery" (-1.2%). Accumulated variations for 2003 show growth in the case of Intermediate Goods (2.1%), but not so for Consumer Goods or Capital Goods, which decreased 1.6% and 1.3% respectively. The balance for 2003 shows differing performances in the three provinces, although in each case it was positive: in Gipuzkoa production grew 2.1%, in Alava 1.2% and in Bizkaia 0.5%.